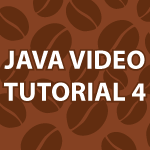 In part 4 of my Java Video Tutorial I cover looping in Java. This tutorial uses a lot of what I previously taught in the first Java Video Tutorial, so watch the previous parts first. Here I start out explaining while loops. I provide numerous examples including how to calculate PI with a while loop. I then go on to explain how do while loops work. I finish the tutorial by covering the for loop. The code follows the video and you should use it to follow along through the tutorial for better understanding. it prints “hello world” infinite times. The reason why you get an infinite loop is because you don’t change the value of your iterator. The value of i must cease to be equal to 3 to jump out of the loop. continue is mainly used to jump back to the beginning of loops. You don’t want to call continue until you change the value of the iterator. Does that make sense? Now, what is the value of l which is output in the bold line? in case of multiple condition declaration, is the default thing to do OR or AND for the for loop?I hope you get what I want to say in the second question. The value would be 19. You would use || in situations when just one needs to equal true and && when they both need to be true. Is that the question? Great tutorial site. You should create this course(and others) on http://www.udemy.com and make some revenue from it.I have purchased several courses on their website. At 3:08 minutes of your video, i.e., i%2==0, you have mentioned if it equals to 0, then we are dealing with odd numbers. But Isn’t it even numbers that we are dealing with? Sorry about the typo 🙁 I some times get slipped up because I improv many of these videos. Over the last year I have gone out of my way to eliminate mistakes like this. There are actually brackets around i%2 .So thats not a problem .Derek is right about dealing with odd numbers and not even numbers. Hi derek, thanks for the tutorial! I have a question about the last problem. for (m=1, n=2; m<=9; m+=2, n+=2) i guess you have to put comma to separate and semicolon to end and maybe that is how it works! O.k now the question, why did you declared only "m" should be <=9 and not "n" and how do you get 1 to 10 when you add +=2? Thank you so much great tutorials!